Here we are, sitting on the tail end of almost two weeks of mostly sunshine, and two whole weeks of slowly dropping flows. Before this, we had constantly fluctuating flows followed by almost four days in which the Smith just kind of stayed around 15-20,000 cfs. That’s too high for us to survey, and in most places too high for fish to spawn. As soon as the flows started dropping, we headed out to see if the high water had brought in any more fish. After surveying three sub-reaches, we were getting pretty convinced that the coho were done, and we’d be stuck surveying, and re-surveying, empty reaches for the rest of the season. “Have you ever tried closing your eyes and seeing how far you can walk before you run into something?” my coworker asked while doing a long walking shuttle on one of our reaches. So it has come to this. This tends to happen toward the end of a field season on most of the crews I have worked on. The novelty and exploration factor slowly give way to tedium and repetition, made worse this season by the shrunken sample frame. But dealing well with repetitive, let’s say methodical, tasks is an essential skill when working in science regardless of whether it’s in the lab or in the field. 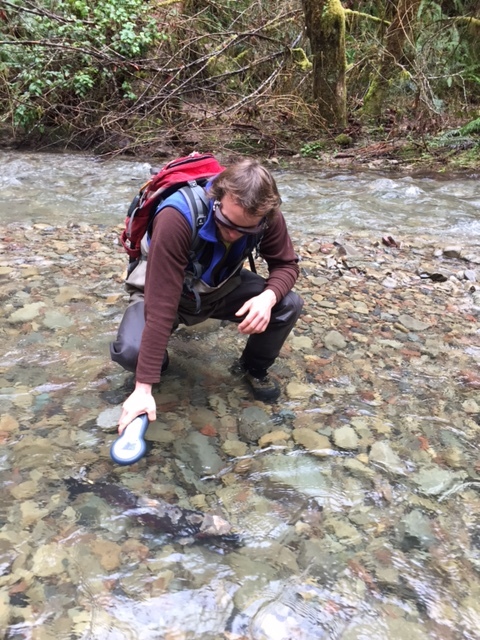 Scanning a (barely) live coho for a PIT tag. Luckily we were happily surprised to find several coho building redds throughout Hamilton creek, our last reach of the day. Hamilton has been an interesting Creek to watch. When I first started on this project it had a perched and impassable culvert just a hundred meters or so above where it joins West Branch Mill Creek. We had done surveys above the culvert but hadn’t seen any sign that fish were getting past it to access the kilometer or so of prime spawning and rearing habitat above. The problem was that nobody wanted to remove the culvert, because that road allowed access to a number of other sites that were in need of restoration as well. 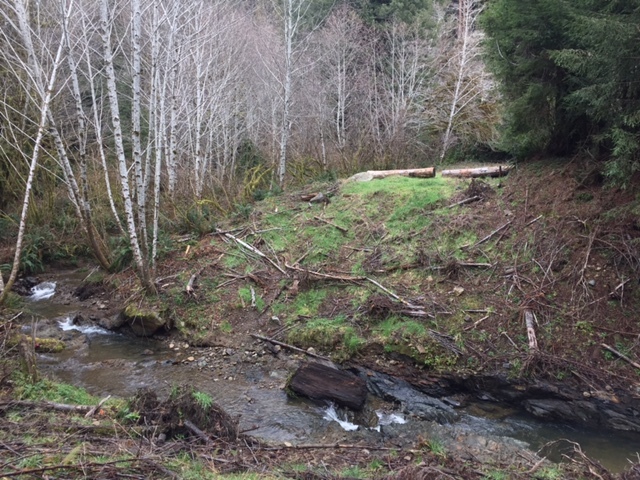 Finally, a couple of summers ago a compromise was reached: Smith River Alliance purchased a mobile bridge unit that would allow some problem culverts to be removed without cutting off access for future restoration projects. And so the culvert was removed. Then the spawning season began and immediately the fish were up there. Chinook came in fairly large numbers, building a surprising number of redds for a relatively small creek. A few coho were seen that first season, but there were no confirmed coho redds. So seeing several confirmed coho redds in Hamilton was pretty exciting. It’s a great example of a restoration project having immediate measurable effects, and that feels pretty good. The creek is also fascinating from a hydrologic and historical perspective. When the road was built and the culvert was put in place, a gradient drop was created. 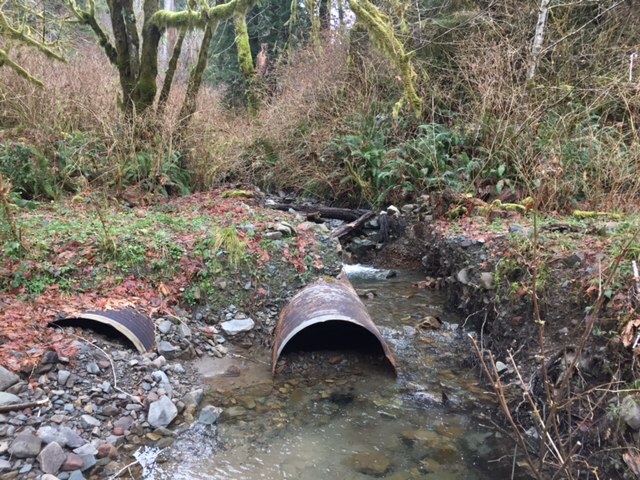 Unlike a bridge which retains the natural stream bed contour, a culvert tends to act more like a dam, gathering sediment behind and flattening out, then dropping steeply downstream of the culvert. When the culvert is then removed, the stream will slowly cut downward, moving back up stream until an even gradient is reached. As it follows this process, the stream bed upstream from the old culvert site is slowly changing and revealing all sorts of strange cultural detritus. Hamilton Creek runs directly next to the main road that was used to access the old mill at the forks of mill creek. As the workers left the mill they would apparently chuck their beverage bottles and trash into the creek as they approached Highway 101 (that’s my theory, anyway) and as the newly liberated creek shifts and moves, all sorts of old bottles, chunks of road and other cultural artifacts are being unearthed. Anyway, as the water dropped out and we got into more of our reaches it became clear that this was the peak of coho spawning. 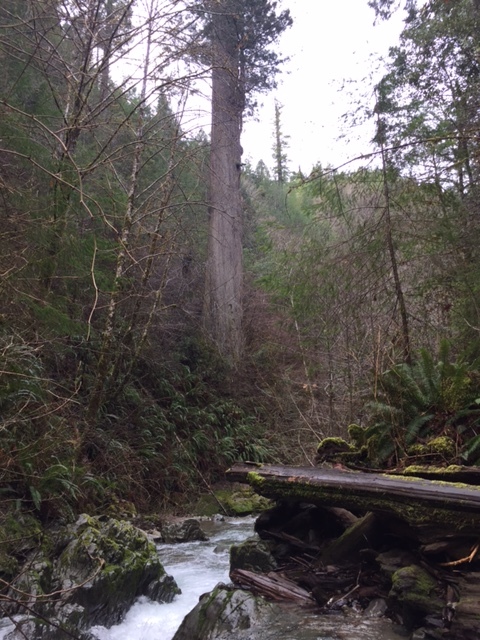 Where before we were seeing a redd or two here and there, now most of our surveys are turning up a few redds in each, and we’re even getting a handful of coho carcasses with their precious DNA data, though no recaptured PIT tag yet. With this stretch of dry weather we’re even getting a great opportunity to re-survey many of our reaches in between big flows, which helps us see fish actively making redds to get positive species IDs on the redds. Believe it or not, there’s still a chinook or two out there, so it is possible that some of these redds were made by chinook. We’re also starting to see our first steelhead redds. But now there is a “semi-stationary” wet weather system sitting off the coast that is forecasted to bring the rain back. High flows now will probably wash out most of the remaining coho, but could bring in a fresh batch of steelhead. So we’ll see how it goes from here.